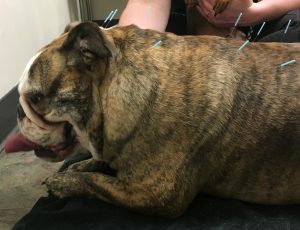 A four year old FS English Bulldog with hip dysplasia, hemivertebrea and suspected cruciate ligament disease was treated with acupuncture with the goals to decrease pain and increase mobility with stairs. She had already been medically managed with some success. She has shown improvement with the addition of acupuncture. Mars is a four year old spayed female English Bulldog who presented on 4/7/17 for her annual exam and vaccines. The owners has noted that she was having increased difficulty with managing the stairs inside their two story home. She didn’t seem painful consistently, but she would stumble when going up and down the carpeted stairs. She had been previously diagnosed with hip dysplasia, received glucosamine supplement daily and Carprofen as needed. She has been taking the Carprofen two to three times per week especially after an active day. On physical exam, she had a stiff gait, resisted extension of her hips, and had palpable crepitus in her right stifle. She had marked kyphosis and decreased flexibility in her thoracolumbar region. She had inflammation observed in her ear canals. Her BCS was 6/9. Neurologic exam was within normal limits with intact CPs. Drawer was negative bilaterally. I designed Mars’ treatment plan to address her hip dysplasia, but also focus on her back pain. I planned to closely monitor her stifles for continued disease, and introduce treatment if she develops any instability. 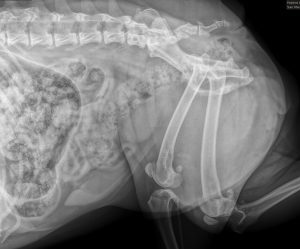 Differential diagnoses for her lameness included hip dysplasia, cruciate ligament disease, Degenerative joint disease, Intervertebral disc disease or other spine congenital malformation. Radiographs of her spine were recommended and showed wedge shaped vertebral bodies at T12 and T13 with spondylosis. She had bilateral shallow acetabulums. 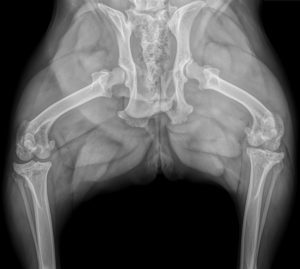 Mars diagnoses were as follows: Hemivertebrae, severe bilateral hip dysplasia, suspected partial cruciate ligament disease, overweight, atopic dermatitis. She presented for her first acupuncture exam on 11/11/17. Her myofascial palpation revealed kyphotic posture, resistance to palpation in thoracolumbar area, as well as taught banding in her interscapular region. I placed 0.16 30 mm Serrin at GV 20 and BL 10. I placed 0.20 30 mm Serrin needles at BL 18-23, GB29, GB 30, BL 54, GV 3, GV 14. I chose points along the dorsum, which would be well tolerated for her first treatment. I did not address any stifle points at this visit because she did not seem to have pain or crepitus at this visit. Needles were extremely well tolerated and left in for 20 minutes. restriction in her thoracolumbar spine. For this days treatment, I decided to skip electroacupuncture to allow for maximal needle time. I placed 0.16 30 mm Serrin at GV 20, GV 3 and GV 14. I placed 0.20 30 mm Serrin needles at BL 18-23, GB29, GB 30, BL 54, ST 36, SP 9, SP 10, BL 40 and BL 60. Needles were kept in place for 20 minutes. Mars was very relaxed during her treatment and was tolerant. She seemed comfortable after her treatments. Since the owner is trained as a human massage therapist, I recommend she start massage treatments for Mars. She emailed us the day after her first treatment to tell us that Mars was already feeling better and was handling the stairs comfortably and controlled. Mars owner is pleased with the results and plans to return monthly or as needed for maintenance. Mars failed to lose any weight during the initial treatment period but now that she is more willing to navigate the stairs, I hope she will have success in the future. Mars continues to take the Glucosamine and chondriton supplement daily, and takes the Carprofen approximately once a week.